Discounting his completely fictional status, I'm more than sure that I couldn't hold a candle to the Boy Wonder when it comes to feats of physical prowess. Nevertheless, I feel compelled to criticize his frequent role as DC's perennial damsel in distress. Sure, we'd all like to see the little guy squirm in the face of yet another evil scheme of any of Gotham's city's resident ne'er-do-wells, but after I while, even the most ardent Robin hater has to feel sorry when he's trussed up yet again. It's gotten to the point where his wrists must feel strange if they're not chafed, right? All that is to say that the creators of DC Universe Online have jumped on the bandwagon and placed a bound Robin at the center of their latest E3 demo. Harley Quinn's holding the spunky little tumbler in the Fun House of Gotham's Amusement Mile, an abandoned theme park. Since Batman has presumably grown sick of rescuing him every few issues, you've been sent in to take care of things yourself. This particular part of the arc is the instanced showdown, but the player will have had made a fair bit of progress in the open world in the course of completing this adventure. Our character for this episode is Dusk Dark, a Batman analog who uses gadgets, acrobatics and a sword to battle against the variety of enemies protecting Harley. The one-handed weapon combat feels like your typical action game complete with juggling combos and timed attacks. In terms of gadgets, the character can launch battlebots to harass enemies or toss out sticky bombs. The environment itself can even offer some offensive options. Giant balls and exploding presents can be picked up and tossed at enemies. After battling his way through scores of enemies, and then having a final showdown against Harley, Dusk Dark is rewarded with a Jim Lee style comic book cutscene that reinforces the mood and story of the encounter. Once that's all done, you can untie Robin and start all over again. Your completion of these encounters (and the various public group missions and dungeon-style raids) will earn you infamy or influence depending on whether you're playing a hero or a villain. You can spend these resources to purchase new gear based on several of the franchise's key figures. You might, for instance, get a new suit from Lexcorp or Metallo, or special costume bits based on Wonder Woman or The Joker. There's also the opportunity to engage in multiplayer instances where heroes and villains fight against each other in objective-based matches. We saw a few of these matches play out during our time at Sony and they looked fun but a bit chaotic, which I suppose is the point of it all in the first place. One of the problems of a licensed hero game where you don't actually get to play as the frachise's big names is that you'll often feel marginalized. The Lord of the Rings Online suffers from a similar problem but has done a good job of using the larger events of its story to give players a sense that what they're doing is still important, even if it's not the main point. The developers of DC Universe Online are challenged to give players a sense that they're playing a meaningful role in Superman and the Joker's backyards, without also being eclipsed by the very characters that attracted them to the location in the first place. Right now, the team is promoting the idea that you get to "live your own legend" within the context of the DC Universe. It's hard (within the course of an E3 demo, at least) to emphasize the ways in which the experience is meaningful beyond the mechanics of the gameplay. 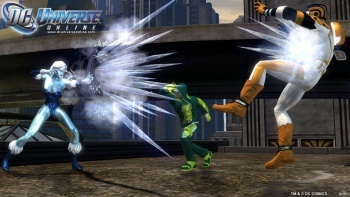 It's a difficulty that City of Heroes and Champions Online have each grappled with, but the stakes are much higher given the familiarity and expectations that people have with the DC brand.